This is the class that you’ve been waiting for! Don’t wait to register or you’ll miss it. This indoor class (beat the heat!) is a fun 6 weeks long. Let the games begin! Can’t do the full 6 weeks? If there is room you can do single class drop ins for $25 .00 per class. Your dog must be friendly toward other dogs and people and be under control around other dogs. Your dog should know how to sit, down, and come with distractions. Want to spend time with your dog having lots of fun and burning off some of your dog’s high energy? Would you like to have fun, but not in the sun? In this indoor class you and your dog will learn some skills that are very much like those used in agility, but with an easy, fun twist! 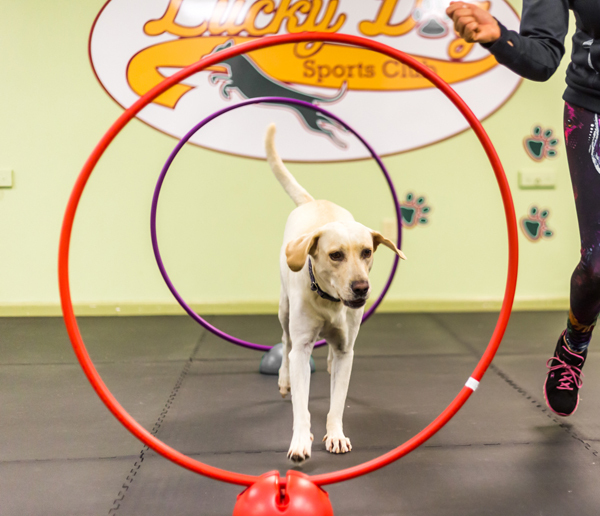 Instead of jumps, your dog will learn to negotiate through hoops (see photo at bottom), eventually being able to be guided through them when they are set up in different patterns such as serpentines, figure eights, pinwheels and more. 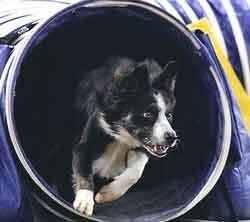 You will also learn how to communicate with your dog to send them through obstacle courses that may include tunnels, chutes, a mini teeter totter and a pause box. Body awareness exercises will be done using wobble boards and planks so that your dog learns how to use his or her body more effectively. We will also practice some recall and attention skills so that you two can work better as a team. 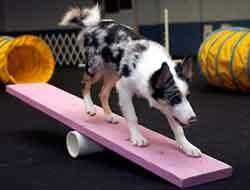 Since this class is very low impact, even healthy older puppies and older dogs can participate. As long as you and your dog can run, this class will be fun!